Media quotes that you both have agreed to have in place, during the next week, a new Cabinet of Ministers, with scientifically clustered and allocated subjects, which will result in economic and effective policy making, realizing the good governance promises of 2015. Towards achieving the above, I believe the first step commitments must come from the Cabinet of Ministers itself, with them being personally and individually bound by Core Values, in exercising good governance, economy, efficiency and effectiveness, at all times, whilst demonstrating integrity, transparency and being bound by the rule of law and principles of democratic decision making and placing the interests of the nation and its people first. 1. Despite the provisions of Article 52(2) of the Constitution, the Ministers will henceforth only engage in setting policy; and will not discharge the expanded responsibilities of direction and control; and will leave all responsibilities connected with the supervision, direction and control of the Ministries, Departments and other Institutions under the Ministry to the Secretary of the Ministry, who will henceforth be duly accountable for such expanded responsibility. 2. Despite the provisions of Article 52(3) of the Constitution, the Secretaries of Ministries will not be changed with every change of the Cabinet of Ministers; or with the change of a Minister. 3. Despite the provisions of Article 55(2) of the Constitution, the appointment, promotion, transfer, disciplinary control and dismissal of all Heads of Departments shall, vest in the Cabinet of Ministers, but be subject to the transparent and due independent evaluation and recommendations of the Public Services Commission and the Constitutional Council. 4. The Ministers and Secretaries of Ministries will effectively interpret the Duties and Functions of the Auditor General, determined based on the English version of the Article 154 of the Constitution, due to the wrong and restrictive interpretation given in the Sinhalese version. 5. The Ministers to collectively commit that they will permit the Law Enforcement Officers of the State and the Independent Regulatory Institutions, to freely carry out their assigned duties, in upholding and enforcing the rule of law ( including in the conduct and progressing of all investigations) , and allow them to so operate without any interference or undue influence by the Ministers, who will further commit not issue any directions, or best advice, either directly or indirectly, in regard to any matters under the review and progress by the said law enforcement officers/regulators. 7. The Ministers, Secretaries and Heads of Departments and Corporations, with the exception of the President and Prime Minister, shall voluntarily cease the use of business class and first class ticket based overseas travel on official state business. 8. Before the end of April 2018, all members of the Cabinet to declare to the Secretary to the Cabinet, a complete schedule of personal and family( family being the spouse, children, step children, brothers, sisters, parents and in-laws ) interests in businesses, professions, contracts, etc and all related party entity interests, connected to the member and his family; and undertake to make a declaration, where ever a conflict of such interests arise or is deemed likely to arise, in connection with any state business, appointment or transaction, either directly or indirectly connected to the Minister and/ or his family. 10. Cabinet of Ministers to collectively commit that all appointments and or nominations made to any person holding office at the level of an Ambassador, High Commissioner, Director, Chief Executive, Departmental Head (including a position of a Deputy or Assistant Departmental Head) of the State, a Ministry, a Department, Public Institution, Public Corporation, Public Private Partnership Company or Regulatory Body, will be only upon such appointment being reviewed and recommended by the Constitutional Council. Mr. Chandra Jayaratne: I have never seen FEATHERS in a “TORTOISE”. Are you TRYING or on a MISSION with those 1 to 10 steps listed above, to see any? IF? Then you are DREAMING. Do you thing the above ten point plan is agreeable to JVP? Bloody humbug and writer must be thinking about “Shangrila”. Hello Mr.; Wake up please, you are preaching to the quire. The entire lot of Political leadership and Majority parliamentarians (let us say around 95%) are the most corrupt individuals on earth. You are taking about good governance. and core values. 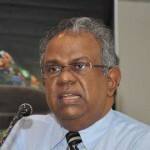 Core values of Sri Lankan Politicians are a) Divide majority and rule b) Steal national wealth, c) Protect corruption using state institutions d) Enact laws and a system to safeguard the interests of corrupt politicians, their families and friends e) Continue bogus if not vulgar power sharing mechanism f) Dupe the international community g) Establish a hedonistic culture. Rule of Law, Democratic Decisions and interests of the nation; Beautiful words if you were referring to another country such as Singapore, South Korea or Japan. Since when you have experienced the application of democratic principles in Sri Lanka. Democracy became gravely ill with the demise of D.S.Senanayake and democracy was finally buried with the death of Dudley Senanyake. I haven’t seen democracy at work or a functioning democracy in Sri Lanka. Two major uprisings by Sinhala and Tamil youths stand as the witnesses. Rule of law ; what is applied in the country in short; RULE of LAW in Sri Lanka is WEAK on the STRONG and STRONG on the WEAK”. The ideas you have stated are not applicable to Sri Lankan political leadership. What a waist of good intentions. If President and Prime Minister can agree to the propose good governance requirements, then this country can overcome the bad image now Sri Lanka has earned. Thanks Chandra for this worthy proposals. May be He is living in a dreamland.There are so many like him in Sri Lanka living under an imaginary cloak of democracy and rule of law that really rejuvenate the corrupt system and corrupt minds. Why aren’t there any more comments on Chandra ‘s excellent proposals? Are our readers used to only exchanging insults in these spaces? Chandra Jayaratne in the letter ~ “……Media quotes that you both have agreed to have in place, during the next week, a new Cabinet of Ministers, with scientifically clustered and allocated subjects, which will result in economic and effective policy making, realizing the good governance promises of 2015…..”. A Cabinet of Ministers “Yes”. New? Perhaps – in Emperor’s new clothes. But ‘with scientifically clustered and allocated subjects’? Never Never Never. ~ “…..The Ministers, with the exception of the President and Prime Minister, shall voluntarily cease the use personal security contingents, back up vehicles, special security details and associated facilities……..”. That is a big big big ask Chandra! Under your terms and conditions, not a single politician will take oath as a minister. Your version of suggestion/advice is 100 % good for the country and the people but practically your attempt will be proved futile. May be some of the backbenchers in the UNP may come forward and accept the ‘core’ values in the public service. Your stipulations have only been limited to the politicians but what about the Secretaries and others down the line? Time should dawn that your dreams turn true. Chandra, it is the same sentiment that had been expressed over several years at different times. Ministers must exit themselves from being managers. Let this responsibility be managed by professionals. If this is to become a reality, ‘Regulatory Authority’ for various state departments has to be legislated. The present authorities vested with ministers will have to be directed to ‘Regulatory Authority’. Minister can only introduce policies. By this we can eliminate the ‘piranha’ ( Asgiriya, Malwatte. Diyawanna) attacks on our beloved citizens. More professionals must check whether they have any adrenaline left in them. These things began since JRJ time. Listen to JVP told during the NCM. There is no yahapalanaya what ever it is the one of the most corrupt govts, said yes to everything. but, both the president and the PM did exactly the opposite. YOu think now they change it. I heard now they ask security even from the Army. that law they go. Ranil s very sinister. President is not that back. IT is no point of asking accountability, honesty from the Corrupt. Does anybody seriously think that any of this is going to happen? Sri Lankan journalists and commentators are full of good ideas. The problem is that the powers that be have their own agenda, namely stay in power at any cost and get rich as quickly as possible. So all these grand ideas are a total waste of time. They are read by the English speaking elite, approved of by them and then forgotten. A week later another journalist will produce another brilliant plan. MR, MS, RW and the rest don’t bother to read these articles. They are much too busy with their own brilliant plans. Native Vedda: “1 to 10” plan PLUS some others would be agreeable to JVP and that is the VERY REASON they are not voted to power. In Sri Lanka, if any “Political Party” agrees to that ten point plan, that party is definitely DESTINED to be in the OPPOSITION for ever or even “Decimated to Zero”. Knowing that, they (JVP) too vote for various “Gill Marts” and “Gimmiks” to the voting and electoral systems of the country. These proposals are all nonsense and will grind the government to a halt. The beaurocracy is as corrupt or more so than the Cabinet in SL. Now give them more power? Are you nuts! The beaurocracy in SL needs to be systematically deconstructed. Top Human Resources who are not corrupt need to be brought in and given real power. No dynamic individual will want to work for the government with these restrictions in place. The is probably the biggest piece of nonsense that Chandra J has written. Thank goodness he is a nonentity with no power.